When I purchased my most recent bonsai, I picked a Jade because she reminded me of the tree of eman. She has a firm foundation, her trunk is very straight, and her branches and leaves tower up into the sky. I named her Kalimatan Tayyibah. 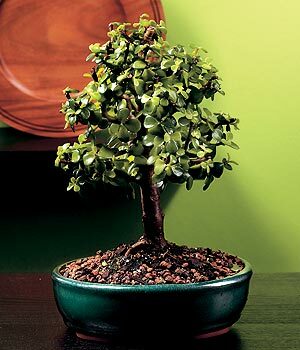 This is just a stock photo of a Jade Bonsai because my Kalimah is much older and more beautiful. Do you not see how Allah makes a metaphor of a good word (kalimatan tayyibah): A good tree whose roots are firm and whose branches are in heaven? It bears fruit regularly by its Lord’s permission. Allah makes metaphors for people so that hopefully they will pay heed. The kalimatan tayyibah in this ayah is a beautiful phrase. The phrase of La illaha illa Allah that there is no deity worthy of worship except for Allah. The phrase of eman. The example of the kalimatan tayyibah is like a beautiful tree. The foundations of this tree will be firmly established. The branches of this tree will tower in the skies. The tree of eman has firmly established roots and its branches tower up in the skies. This tree, the tree of eman, gives its fruits at all times by the permission of its Lord. And Allah makes parables for mankind so that they can ponder over them. The branches of this tree of eman tower in the skies as does eman once it exists in the heart then it cannot remain hidden. It will be seen by everyone, just like a tall tree is a landmark for everyone around it. Everyone can see it towering in the skies. So too is eman when it exists in the heart it will be seen in the actions. It will be seen in the characteristics, the akhlaaq, in the muamalat, how you treat one another, in the worship to Allah subhana wa ta ala, it will not remain hidden. This tree of eman gives it fruits at all times by the permission of its Lord. You can always pluck fruits from this tree of eman wherever you are. At any time and at every occasion. This is in contrast to other trees because all other trees give their fruits once a year, twice a year, or maybe once every two years. But they never give their fruits year round. But the tree of eman is different. Wherever you are, in any situation, in any circumstance, anytime if you have this tree of eman, you can pluck fruits from this tree. You can benefit from this tree of eman. And this is example that Allah subhanahu wa ta ala gives of eman so that we can ponder of this parable. “The Fruits of Iman” was one of the first lectures of Shaykh Yasir which I heard a few years back. And subhan Allah I had not known about this wonderful parable and the fruits of Kalima Tayyiba. Ever since I am hooked onto Shaikh Yasir’s lectures and Al Magrib. Wonder when can we have an Al Magrib seminar here in Bangalore, India.